The 21st century has been dubbed The Asian Century . Economic growth has led to huge investment in higher education in the region, which is paying off as Asian universities advance consistently up global rankings. Times Higher Education ’s latest international league table shows that university education in Asia has significantly improved over the last year. The National University of Singapore, the region’s leading institution, reached its highest ever position (24th) in the Times Higher Education World University Rankings 2016-2017. China’s two flagship institutions, meanwhile, have also climbed the international league table – Peking University is 29th, up from 42nd last year, and Tsinghua University is in 35th place, up from joint 47th. Two new institutions have made the top 100: Chinese University of Hong Kong and Korea Advanced Institute of Science and Technology. Another four join the top 200: City University of Hong Kong, University of Science and Technology of China, Fudan University and Hong Kong Polytechnic University. Overall, 289 Asian universities from 24 countries are in the global list of 980 institutions, with 19 in the top 200. 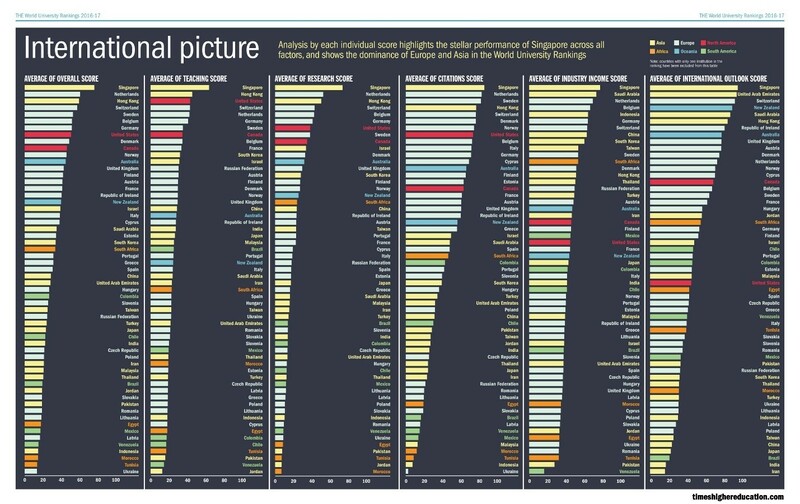 At country level, Singapore stands out. When looking at which nations achieved the best average score, the city-state comes top on all five of the ranking’s pillars: teaching, research, citations, industry income and international outlook. 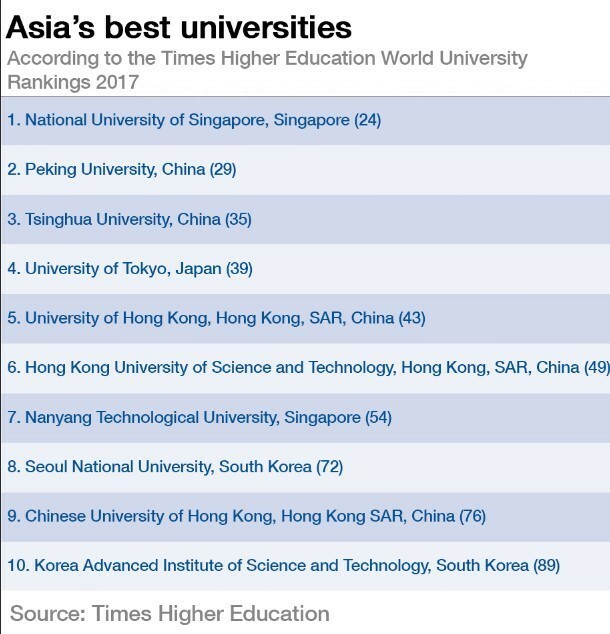 Hong Kong comes second for teaching, third for research and fourth for citations. Lim Chuan Poh , chairman of Singapore’s Agency for Science, Technology and Research, says: “The focus of our universities is to provide the best education to students to prepare them for an increasingly dynamic and competitive global and regional environment. What’s behind the rise of Asian universities? Rajika Bhandari, Deputy Vice-president of Research and Evaluation at the Institute of International Education, told Times Higher Education that it comes down to three main factors: rapidly growing populations and demand for higher education in the region; governments making “significant investments” in universities; and improvements by individual institutions. For example, last year the Chinese government launched a new excellence initiative , dubbed “World Class 2.0”, which aims to establish six universities among the top global institutions by 2020. Other Asian nations including South Korea, Singapore and Japan have also introduced government initiatives specifically aimed at boosting the performance of their higher education sectors.